A thermistor is a thermal resistor - a resistor that changes its resistance with temperature. Technically, all resistors are thermistors - their resistance changes slightly with temperature - but the change is usually very very small and difficult to measure. Thermistors are made so that the resistance changes drastically with temperature so that it can be 100 ohms or more of change per degree! There are two kinds of of thermistors, NTC (negative temperature coefficient) and PTC (positive temperature coefficient). In general, you will see NTC sensors used for temperature measurement. PTC's are often used as resettable fuses - an increase in temperature increases the resistance which means that as more current passes through them, they heat up and 'choke back' the current, quite handy for protecting circuits! First off, they are much much cheaper than all the above! 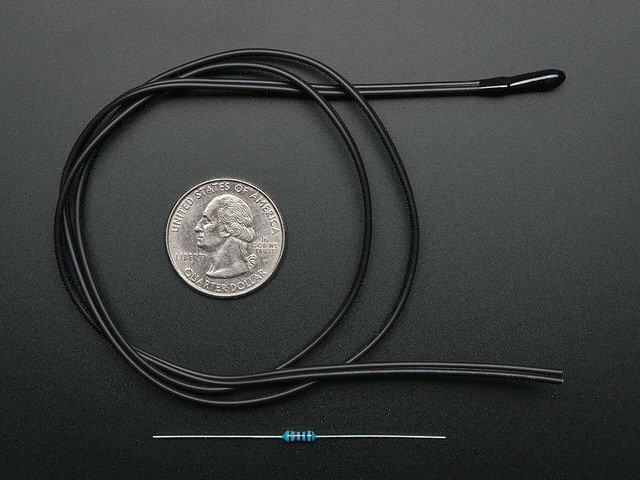 A bare 5% thermistor is only 10 cents in bulk. They are also much easier to waterproof since its just a resistor. They work at any voltage (digital sensors require 3 or 5V logic). Compared to a thermocouple, they don't require an amplifier to read the minute voltages - you can use any microcontroller to read a thermistor. On the other hand, they require a little more work to interpret readings, and they dont work at very high temperatures like thermocouples. Without a digital-to-analog converter on board, you might be better off with a digital temperature sensor. Even if you do use a microcontroller or complex system, for the price you can't beat 'em!